Comm Eye Health Vol. 31 No. 103 2018 pp 70-71. Published online 09 November 2018. Research Fellow: London School of Hygiene and Tropical Medicine, London, UK. Ophthalmologist/ Lecturer: Kenya Medical Training College, Nairobi, Kenya. Penetrating injuries require immediate first aid and urgent referral to a specialist, particularly if there is a foreign body in the eye. Up to 40% of penetrating eye injuries are complicated by the presence of an intraocular foreign body (IOFB).1,2 It may be toxic (iron, copper, vegetable matter) or inert (glass or plastic). Vision loss may result from the mechanical injury or from post-traumatic complications such as endophthalmitis, retinal detachment, metal toxicity and sympathetic ophthalmia.2 Prompt diagnosis, referral, removal of the IOFB and surgical repair will help to preserve the visual acuity and the globe anatomy. When the patient presents, conduct an initial trauma assessment and resuscitation (if necessary) using the airway-breathing-circulation-disability-exposure (ABCDE) systematic approach.3 Ask about systemic comorbidities, allergies to medication and time of last meal. Non-ocular injuries, such as head injuries, should be managed with the help of other specialists. Record the baseline best-corrected visual acuity in each eye and conduct a complete examination of both eyes and adnexae. Use Desmarre’s retractor to avoid undue pressure on the globe during examination. 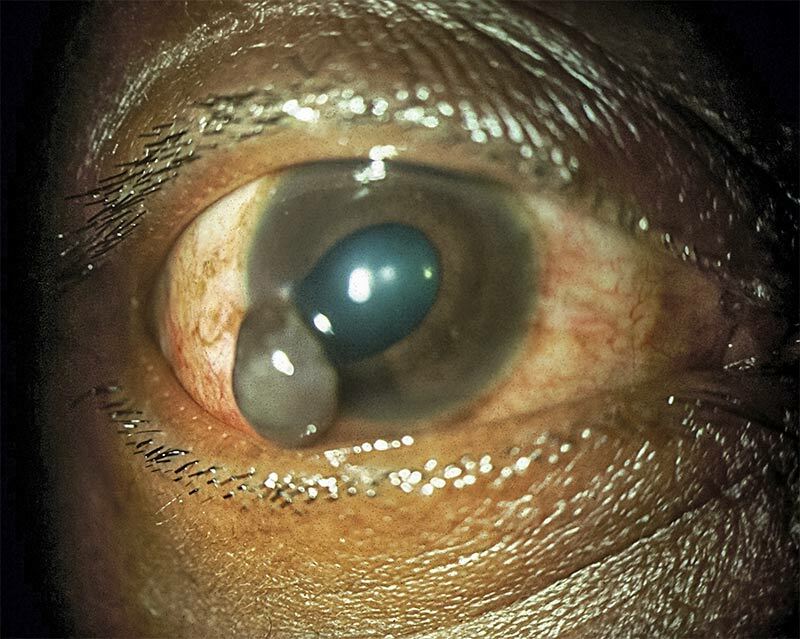 History and clinical findings that should raise the suspicion of an IOFB include: a history of hammering a metal object, a scleral wound with uveal prolapse, a corneal entry point with oedema, a shallow anterior chamber, an iris hole, an irregular pupil, a lens defect and vitreous haemorrhage. Protect the eye from further damage by using an eye shield. Administer prophylactic broad-spectrum systemic antibiotics. Administer anti-emetics if the patient has nausea or vomiting. Recommend ‘nil by mouth’ status in preparation for surgery. Carefully document all findings and actions taken. Do not attempt to pull out any foreign material that may be sticking out of the eye. An operating theatre where urgent removal of IOFB, intravitreal antibiotic injection and surgical repair can be done. Gently explain to the patient that multiple operations may be required and that visual prognosis is uncertain, but taking up the referral as quickly as possible will give them the best chance. Send the patient with a comprehensive referral note and alert the surgeon. Information. Contact details of the nearest referral centre that can provide vitrectomy surgery. 1 Parke DW, Flynn HW, Fisher YL. Management of intraocular foreign bodies: a clinical flight plan. Can J Ophthalmol 2013;48:8-12. 2 Loporchio D, Mukkamala L, Gorukanti K, Zarbin M, Langer P, Bhagat N. Intraocular foreign bodies: A review. Surv Ophthalmol 2016;61:582-596. 3 Mutie D Mwangi N. Assessing an eye injury patient. Comm Eye Health J 2015;28(91):46-48.